Dominate High Traffic Aisles - Place your advertisement in high traffic floor intersections, perfect for busy show floor aisles or public lobbies. 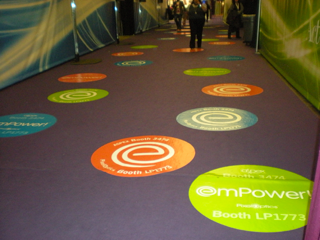 This floor marker will direct your prospects to your booth. Custom shaped floor graphics are available upon request and priced separately.